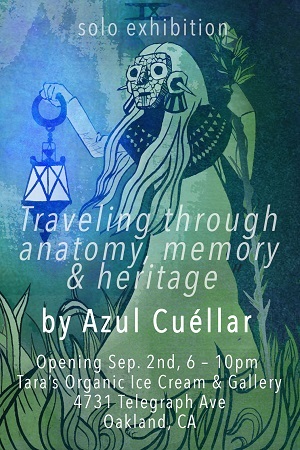 "Traveling through anatomy, memory and heritage" is a collection of pieces that document some of Azul Cuellar’s most personal aspects. Since leaving her home country, Mexico, to come study illustration to the Bay Area, Azul has become more and more aware of the impact her culture has had on her artistic expression. Heavily inspired by Mexican muralist Edgar Saner, among other Latin American artist, Azul embraces her heritage by creating illustrative works that resemble Pre-Hispanic art. She also has developed an increasing interest in spirit science and other related subjects, such as anthroposophy, and sacred geometry. Dreams, memories, mandalas and fantastical anatomy have become a recurrent subject-matter in Azul's work. "